Motorola Xoom (32GB, wi-fi) review | What Hi-Fi? You’re looking at the biggest threat to the iPad’s superiority. 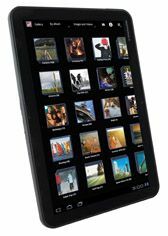 Powered by Google’s Android software, the Motorola Xoom is the first with the 3.0 version, designed especially for tablets. With a formidable set of specifications to boot, if anything can steal Apple’s thunder, this is it. Your entry-point is a 10.1in, 1280 x 800 resolution touchscreen. There’s not a sniff of a button on the front – the screen on/off button is on the back, the volume controls on one edge. Inside there’s a 1GHz dual core processor, 1GB of RAM and a 32GB hard disk. Integrated wi-fi, Bluetooth support, an HDMI output, plus two cameras including a front-facing one that can shoot 720p HD video. There are SD card and USB inputs, though the former is yet to be ‘enabled’ by a firmware update. The Xoom is fast, intuitive and enjoyable. Touch control, while not as ultra-responsive as the iPad, runs it very close, while the customisable home screen and scrolling menu system is attractive. Web browsing (with flash), maps and email integration are slick, though motion judders when really pushed, and the music player with scrolling artwork works well. Apps, so key, are murkier. Spotify, Facebook and Twitter are here but there’s not the breadth of applications yet. With Android’s popularity rocketing, this will surely change – and fast. Sonically – MP3, AAC and WAV – it’s good; punchy and musical, and lacking only a little insight compared with the iPad. Video is a mixed bag: there’s no AVI or MKV but it will play HD content and look good. YouTube’s best quality video is sharp and detailed, although motion can be a little jumpy.